You’ve walked by it dozens of times, as you leave the Plazuela and head down towards Topolo or the Mercado Pino Suarez—El Archivo Municipal. It’s a beautiful and colorful old building, but have you ever peeked in? Yesterday Greg and I got a terrific tour by a long-lost acquaintance of ours, Chon (Concepción), who was our waiter back in the day at the Hotel Camino Real, where we were married. We were thrilled to see it all! Our city, Mazatlán, has (literally) tons of written archives dating back to the early 1800s. It is a treasure trove of history and heritage!!! Rooms and rooms full of city historical records, piled floor to ceiling, many dating from the early 1800s! We saw some of the earliest maps of Mazatlán, Angela Peralta’s wedding certificate, construction permits for some of our most historic buildings, etchings of the French invasion of our port, and editions of every newspaper ever published in our fair city. Click on any photo to view it larger or see a slideshow. While in Europe, Canada or the US such an archive might be something we take for granted or at least expect, the fact that we here in Mazatlán have such an incredible resource is truly remarkable! Culiacán’s archive burned down, so they lost most of their historical records. But, throughout the centuries and despite decades of minimal funding, our Archivo Municipal is a sight to behold! Historians, researchers, university and school-aged students are able to come in here to look up what they need to know, thanks to the foresight and perseverance of our forebears. We met, or re-met, Chon, who speaks beautiful English. We met the lovely Lorena Ferral, who is so excited to see interest in the archives. They are very passionate about the work they do. They love the treasures they guard and catalog to the best of their abilities—and the limited resources allocated to them. The head of the Municipal Archive is Aristeo—Sergio Aristeo Herrera y Cairo Yarahuan—though he was not present during our tour yesterday. Staff members bind some of the documents by hand, using serviceable yet antique, artesanal equipment. I thought you might like to see. How did we come to be at the Municipal Archive? For several years we’ve been loving the photos of Viejo Mazatlán that the Amigos Viejo Mazatlán group has been sharing on Facebook. A year or so ago, we met Fernando Higuera when we went to the Plazuela to buy a CD of the photos from him. Monies received were earmarked to fund a museum of the photos of old Mazatlán. Since then, the Amigos Viejo Mazatlán has held several exhibitions, historical talks, and fundraising events. I wrote about one of those events here. We’ve stayed involved with the group, and we keep hoping and working to create space for a photo museum here in town. The good news for our small yet significant project is that we might be given a room at the Municipal Archive in which to display historic photos of our fair city. What is especially exciting to me is the perfect dovetail this would be! 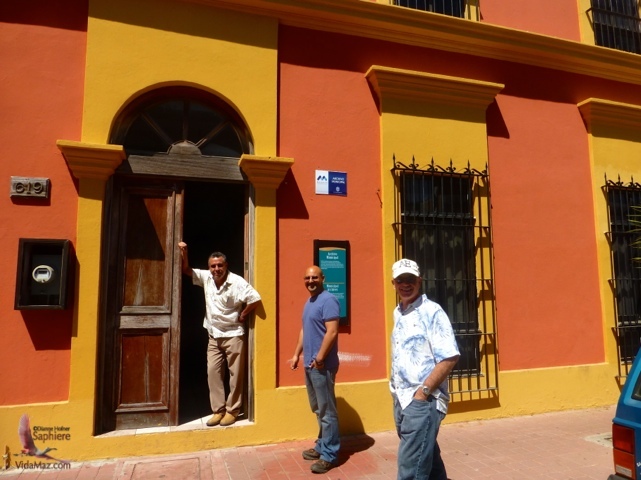 Amigos Viejo Mazatlán could display historic photos alongside documents from the city archive. The Municipal Archive could be reinvigorated by public talks and events, by locals and tourists coming in to view photos, thus raising awareness of the treasures it guards within. The Municipal Archive needs time and attention! Many of the documents are fading, crumbling; they need expert care. If you have archivist or restoration skills, please let Lorena Ferral at the Archive (981-00-48) or Fernando Higuera of Amigos Viejo Mazatlán know! Join with us to help preserve and make public Mazatlán’s rich history! The archive has a small display of books on Mazatlán’s history, along with a price sheet. If you read Spanish, you may be interested in a volume or three. This is yet one more piece of bright news for our city’s heritage! Right now, several new museums are in various stages of planning: one of Sinaloan music, another on Carnavál history, and the new Neto Coppel city museum that was front page news earlier this week. To us that is all good news. 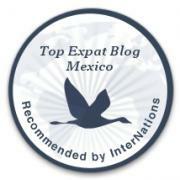 Mazatlán has so much to be proud of! Locals, national and international tourists need to know about our claims to fame! And a city that is proud of its heritage builds on its strengths. I’d like to wish godspeed to all these worthwhile projects.